Are you looking for a luxurious concrete look thanks to home concrete? 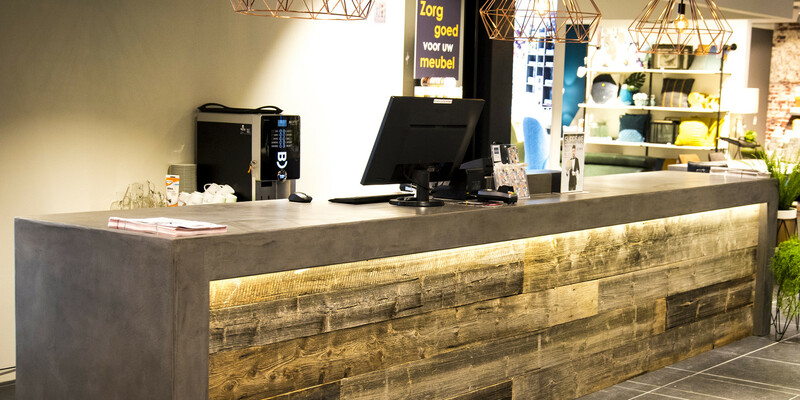 We are the pioneers that introduced concrete finishes for interiors in the Netherlands. We place concrete in houses, shops, offices and showrooms. We offer natural concrete looks or metal looks, with elegant colours and patterns. Our home concrete will give you the best value for money, a unique look and it is suitable for a wide range of applications. We offer concrete finishes to private individuals and companies and we work with DIY-enthusiasts, building advisors and interior designers. Any questions? Get in touch, we would be happy to advise you. Would you like to see and feel the concrete for yourself? Make a showroom appointment and bring your colour sample. We can achieve an exclusive look with micro concrete for concrete look floors, furniture, kitchens, bathrooms and porches. Surfaces can be stone, cement, plaster, synthetic, tile, or MDF. Micro concrete is incredibly hard, waterproof and stain resistant. It can be made in any colour tone and can be made in an anti-slip version as well. We have actively used the name micro concrete. It depicts the composition but because of all the other names that have sprung up, we prefer to say home concrete now. We struggle with the term micro cement. If you think cement, you might think crumbly, while home concrete is solid, sleek and elegant. Impressive that product marketers have managed to come up with this new name. It is a decent description of applying thin coats of home concrete. Concrete plaster is a name that plasterers and handymen seem to use a lot. Home concrete is more complex and offers more possibilities than regular plaster. Beton ciré is what it all started with in the Netherlands about 10 years ago. The name beton ciré still feels familiar, but we have grown since then. The term “decorative concrete” isn’t used as much in the industry but we feel it is a better description than the other terms above. We were at the forefront of the introduction of home concrete in the Netherlands. Our 10 years of experience with preparing, processing and finishing home concrete has become real craftsmanship. Our goal is high quality and great satisfaction when it comes to home concrete. That is why Beton DeLuxe doesn’t just take jobs, it also gives courses to other providers and processors of home concrete. Good value for money and happy customers are the result of flawless composition, well-planned processing, perfect finish and smooth service. We have many examples of concrete look floors, concrete look walls and concrete look furniture. Contact us if you would like to visit our showroom or a home concrete project.